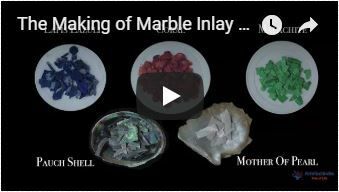 An Indian Pietra Dura White Marble Inlay Plate inlaid with semiprecious stone Lapislazuli, Turquoise, Malachite, Mother of Pearl, Pauch Shell, Carnelian and Jasper. All set in an intricate floral design. This beautiful White Marble Inlay Plate is made by descendants of the original artisans who decorated the marble walls of the Taj Mahal Agra India. The unique quality of the white marble is that its translucent with the light, you can see in the 2nd image. Wall plates are exquisitely handcrafted from fine marble and semiprecious stones. It is very hard to work. The size of White Marble Inlay Plate is 8 x 8 inch. The White Marble Inlay Plate will be delivered by Fedex or Dhl free of cost door to door.